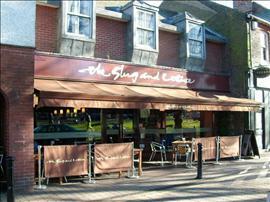 This venue is situated in Harpenden. Limited parking is available in the road outside the venue. The step is located just beyond the entrance. The distance between the floor and the lowest table is 77cm (2ft 6in). The type of food served here is a modern pub menu. This accessible toilet is located beyond the entrance to the left. The key can be obtained from bar staff. The female toilets are located beyond the entrance to the left. The female toilets are 6m (19ft 8in) from the accessible entrance. The male toilets are located beyond the entrance to the left. The male toilets are 8m (26ft 3in) from the accessible entrance.